The acknowledged master of African drumming presents essential techniques, rhythmic patterns, and concepts for drummers of all levels. 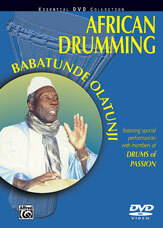 The spiritual powers of "the drum" and drumming are the focus of this DVD. Inspiring lessons and performances will expand anyone's playing on the Ashiko, Djembe, and related drums.